Antique mechanical record players have similar characteristics to antique clocks. They have gears, springs, governors, etc. This unique repair came into the shop the other day. The customer reported the governor of his Victrola was broken. Upon partial dis-assembly the governor was "Repaired" at one time. 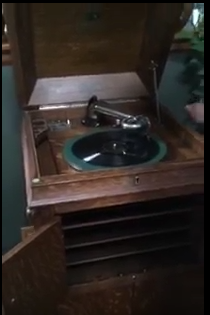 Here is a picture of the Victrola. The customer was correct. The balance/governor was broken. An old mainspring of the same strength and width was used to repair the governor. 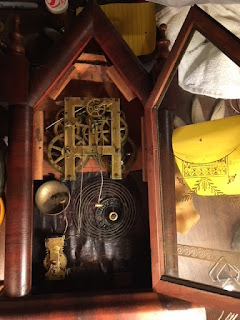 The mechanism was disassembled and cleaned. The mainsprings were very large for my Keystone mainspring winder. Carefully I removed the spring cleaned them and reinstalled. The winder was a little small for the process but with care I was able to complete the job. Here are some pictures of the process, Enjoy. The clock had a horrid repair life. The repairmen did some creative repairs. For example every hole was punched/pricked to close the hole. Not all of them needed this treatment. pricking is not a standard repair anyway but a repair person pricked them all. The click springs were repaired previously. The repair had a ton of excess solder and a homemade click spring. They did work well however. It was decided since they worked well and created un-reversible damage to the wheel to leave these along.